If you’re after an assortment of decking supplies Perth knows it can rely on Timber Decking Supply Shed. All deck screws are stainless steel 304 grade and therefore resistant to rusting. Contact us to learn more about our range of deck screws. We supply 7g, 9g, 10g and 14g screws. 14g x 75mm or 100mm – generally used in commercial applications. We also sell type 17, Wing-tek, class 3 hot-dipped galvanised screws which are specially designed for fastening timber to metal. The special wing close to the point of the screw enlarges the hole diameter of the timber without compromising the strength of the wood. Once contact is made with the base metal, the wings break off on contact leaving the threads of the screw shank to complete the job. Batten (Bugle) Screws are more suited for a commercial application and/or for heavy duty use. 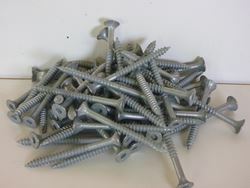 These screws are 14G and we stock both the 75mm and 100mm.